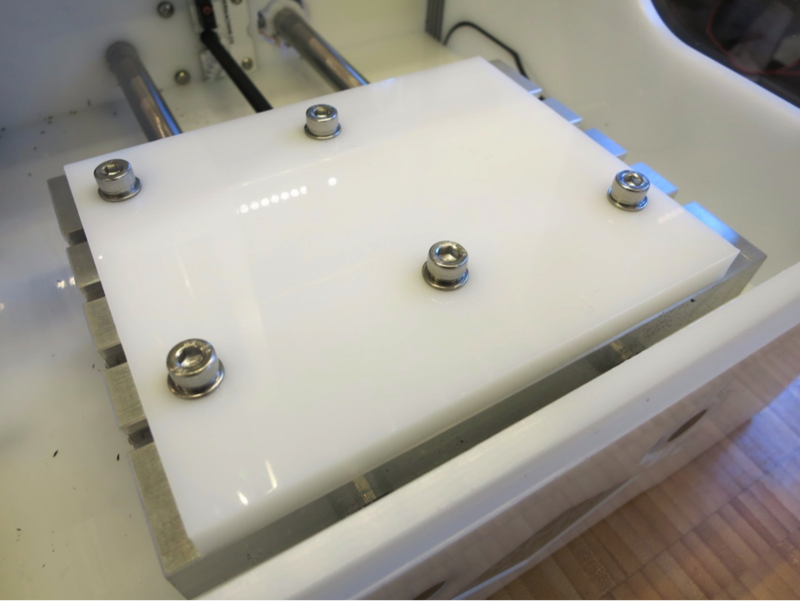 If you want to level up your fixturing ability, you can remove the spoilboard and bolt your material directly to the T-slots in the Bantam Tools™ Desktop PCB Milling Machine’s T-slot bed. Because bolts are much stronger and more rigid than other methods of attached the material to the machine bed, like tape, there is less vibration in the workpiece. Less vibration means you can mill faster, achieve greater precision and nicer surface finishes, and increase the life of your cutting tools. Pretty awesome! The trade-off is that it takes longer to set up and there are more steps involved. This is an advanced guide that assumes you already have some experience using the milling machine. The first thing is get acquainted with the y-bed dimensions (scroll down to the y-bed section). The slots are 20 mm (0.787") apart and 5 mm (0.197") wide. You need to use M5 bolts and low-profile M5 nuts. The slots descend 7 mm – 9 mm (0.276" – 0.384") into the y-bed, so the shafts of your bolts need to be that much longer than the thickness of your material. You can use washers to take up any extra length. If you’re planning to mill something that you’ve already modeled in a CAD program, it’s pretty simple to add holes around your model. For extra precision and alignment, you can download the .step file of the y-bed and import that into your CAD program. Then generate toolpaths for the bolt holes, and you’re ready to go. If you’re planning to mill something that isn’t modeled in CAD, such as an .svg file, you’ll need to make an additional .svg file for the bolt holes. Depending on the size of your material, make between two and four 5 mm solid circles that are 20 mm, 40 mm, or 60 mm apart vertically. Here’s an .svg file for 5"x4" material, which you can right-click to download and use yourself. If you’re using Fusion 360, you can use this handy .f3d file and customize it to your liking. It has fancy counterbore toolpaths already generated, so your bolts will be flush with the surface. If you’re not using Fusion 360, here’s a .step file without the toolpaths. Use a 2.5 mm hex key to remove the four screws from the spoilboard. Note that while the spoilboard will still appear in the software, you can locate a tool from the surface of the T-slot bed and your parts should mill correctly. Remove the spoilboard from the machine. Attach your material to the y-bed with High-Strength Double-Sided Tape. Mill the bolt holes in your material with a 1/8" flat endmill. Detach the material from the y-bed and remove any tape. Insert low-profile M5 nuts into the slots in the y-bed. Stick M5 bolts through the holes in your material. Place your material on the bed and thread the bolts into the nuts. Note: Be aware that the software doesn’t know where your bolts are. To make sure it doesn’t accidentally run the cutting tool into your bolts, we recommend making your material size larger in the software, such that it encompasses the area taken up by the bolts. An even better idea is to counterbore your holes so the bolt heads lie flush with the material surface.